This chapter will address the relationship between eastern European socialist states and apartheid South Africa. Employing material from archives in South Africa, Poland, Hungary and the GDR, and from international organisations that dealt with anti-apartheid (e.g. UN - WFTU - IUS - World Peace Council), this piece will address the changing relationship between apartheid/anti-apartheid and the region’s elites, intellectuals and societies. 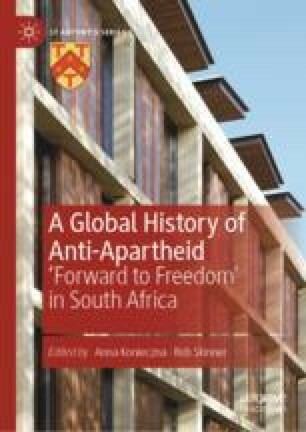 It explores the support that eastern bloc regimes gave to the anti-apartheid movement in the 1960s, focusing in particular on the importance of new alliances between the region and Africa in a host of international organisations. In the second part, it examines the limitations in these relationships, addressing (a) the increasing entanglement between eastern European Communists and the apartheid regime in the 1980s; (b) the often limited reach of anti-apartheid sentiment in eastern European societies (compared to support for e.g. Vietnam or Chile) and (c) the tensions that emerged between the region’s dissident movements and organisations that opposed apartheid. Kőszeg, Ferenc. “Párt és állam.” Beszélő 2, no. 2 (1990). Accessed August 1, 2018. http://beszelo.c3.hu/print/2868. Szabó, Miklós. “Egy tilalommal kevesebb, vagy egy elvtelenséggel több?” Beszélő 2, no. 2 (1990). Accessed August 1, 2018. http://beszelo.c3.hu/print/2868.